Septum piercing, a piercing on the “cartilage wall between the two nostrils” is becoming popular, especially among the younger generation. However, it needs good care to avoid infections or getting hurt since even a minor brush or violet nose blowing can easily hurt it and cause bleeding. 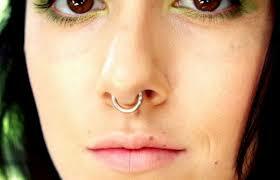 In general your piercing on the septum will take about 6-8 months or up to a year to heal completely. During this time, you must take good care of your piercing or else risk getting infections. You can also get infections years afterhealing is complete. Necrosis of Nasal Wall One of the most serious problems associated with nose piercings is necrosis of the nasal wall. Necrosis means the localized death of living cells. Nose piercings through the septum and both lateral walls are potentially at risk for necrosis.